Our “heritage” is a term that gets tossed around a lot, even in a young country like Canada. But what exactly is heritage? How will the Torontonians of the future remember the Torontonians of 2016, or of the 21st century? It seems from the construction in the downtown core that it’s going to be condos: the unimaginative sky-high concrete boxes that seem to be taking over the city. 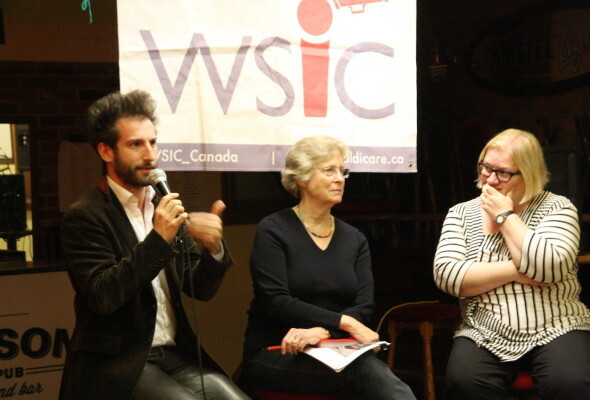 As one of our guests at our May 11th WSIC event put it, “Our buildings look like vertical spreadsheets”. And in some parts, they seem to be taking over places of cultural significance. In my own community of Bloor West, the Humber cinema, built in 1948, is being threatened by one of these spreadsheets. Another classic cinema in the area now houses the village’s Shopper’s Drug Mart. But is there anyone out there regulating this rapid takeover? And is there room for public participation in the decision-making prcess? We joined three planners for an extremely interesting discussion on what we are and should be preserving, what we’re turning into condos or other buildings, and what’s in store for the future. Tamara Anson-Cartwright is a program manager for Heritage Preservation Services for the city. Lynne DiStefano is a professor and co-founder of the Architectural Conservation Programmes at the University of Hong Kong, and has been long involved with UNESCO’s heritage conservation projects. Alex Josephson is the co-founder of Partisans architectural firm in Toronto, and lectures at the U of T Daniels Faculty of Architecture. “We have a bit of a hangover from knocking down everything after World War II”, commented Josephson. The city is trying to preserve everything that it can, and what Josephson believes is that we are not thinking about it enough. As DiStefano pointed out, often heritage comes down to ordinary things, which is of course different for different people. Heritage sites are those places that add to the collective memory of a place and collective attachment to it. Ontario Place, for example, is not your typical heritage building. However, Anson-Cartwright found herself on a board that decided that part of it was in fact significant to Toronto’s heritage. She also received a very interesting piece of advice from an old mentor: “don’t be nostalgic”, which gives an interesting contrast to what we normally perceive as heritage. Designed by the pioneer landscape architect Michael Hough, Ontario Place was the first patio in Ontario to get a liquor license—just one small aspect of its emobodied experience. In the end, it’s all about context. And context became a major theme of the night, as we discussed the importance of cultural landscapes in decisions about preservation or adaptive reuse of buildings and other community spaces. In 2005, the term “cultural landscape” was used in the Ontario Planning Act for the first time. Together with the Ontario Heritage Act, there are multiple avenues in which a building or even a neighbourhood can receive protected status from the city. The challenge seems to be finding a use for heritage buildings once they have protected status. Great examples of adaptive reuse in the city are landmarks such as Union Station and the Hockey Hall of Fame. Other spaces, such as the Dunlop Observatory in Richmond Hill, make use of public-private partnerships so that the community has a vested interest in keeping a space alive. The important part is deciding what parts of a site are significant, and finding a way to preserve those parts that also works within the current local context. Josephson put it bluntly when he said “ We’re not building for the future. We’re building for a 25-year mortgage.” As a city, we need to start thinking about what this city is going to be remembered for in 25, 50, 100 years. We already know that buildings such as the CN Tower, Ontario Place, and even the controversial ROM Crystal, have and will continue to define the 21st century Toronto, but what else will there be? Perhaps the Hearn Generating Station, set to be presented in revitalized form for the upcoming Luminato festival? What about, as Josephson mentioned, the ugly but historically significant industrial fabricating spaces near the airport? Though it is the architects who are designing our buildings, the public has a huge role to play in defining where we go with our architecture. Why do we keep building condos? It’s because they are cheap, profitable, and the public isn’t demanding more. Every panelist through the course of the night mentioned the rise of grassroots participation and the power of the consumer. We have the power to decide what Toronto is going to be remembered by through the things we buy and the things we publicly vouch for…Which leaves one question: What could happen if we actually did start caring?